Kappler Mill & Lumber Company and Evergreen Hill Designs are pleased to offer custom laser cutting services. This document describes the procedure and gives some general guidelines on working with us on custom laser services. The process begins with your idea. The first step is to contact us to discuss the feasibility of your idea and to give you some general idea of what you’ll be looking at. One of the first questions we get is "how much does it cost?" There is no simple answer for this; each job is different and is priced accordingly. Wood cost depends on quantity and type; laser time is billed by the minute as the laser is cutting. Straight lines cut very quickly and curved lines cut more slowly, so a very complicated building with a lot of curves will cost more than a simpler building with basic straight lines. A subsequent question is "what do I need to supply?" The answer to this can be anything from a dimensioned sketch on paper to a prepared CAD file (in .DWG format). We can work with a sketch and set up the file for you; the rate for this is $35 per hour. If your drawings are straightforward and include all necessary information, these drawings go fairly quickly for us and in many cases we can complete these in an hour. Another question is "what all can you cut, and how thick can it be?" We routinely cut basswood, pine, cardstock, and acetate sheets (for window ‘panes’). We can cut most any wood up to 1/8" thick, and we’ve cut material as thin as a sheet of paper. We DO NOT cut styrene or any related material; the fumes from this kind of cutting are hazardous and the cut quality is poor. We are unable to cut metal of any kind. Call or write for details on any special materials that you’d like us to cut. Run size: There is no minimum run size. We can cut one kit or several thousand kits; as you might expect a single kit might be relatively expensive because of any setup charges, etc. Step one is to know exactly what you want. We do not do any fieldwork of any kind; it is expected that you already know the sizing, dimensions, etc. for the project you would like to produce. In other words, if you want to do a scale model of the "Yellowjacket Creek Station", we’re not going to track down any of the measurements, etc. We expect you to have already collected a full set of dimensions, right down to the sizes of doors and windows, type of roofing, etc. Speaking of dimensions, we can work with actual dimensions or scale dimensions, just let us know what you’ve got. For example, your drawing can indicate that a door is 3 feet wide and we can do the math for you (as a part of the setup, which is billable time) or you can indicate the door is .414 inches, which is the actual size in HO scale. One more detail: Assume .005 inches for the beam width, although this can vary with thicker material. Step two is to contact us to discuss your project. The details of your project will be kept in the strictest of confidence; we cut our own kits under the Evergreen Hill Designs brand name, as well as kits for other manufacturers. We also rely on other manufacturers for kit components we do not manufacture, so we definitely know the value of keeping these things under wraps. It is during this initial discussion that we can all get some idea of what we’ll be up against. Step three would be to cut you a sample run and send to you for approval. You then get back to us with any adjustments, etc. and we proceed from there. At this step, the importance of having your measurements correct from the outset becomes very apparent. We will make any adjustments due to "quirks" in the laser cutting process, but any changes required because you discovered incorrect measurements, etc. will be billed to you. Step four we’re in production! You specify the run size and we’ll deliver it to you. We will also keep your files on hand for subsequent runs. NOTE: If you’re not an existing Kappler or Evergreen customer, you’ll be required to pre-pay the order or we’ll be glad to ship it C.O.D. All dimensions are in place; even if this is a sketch on paper the setup time would be minimal. We would have to do calculations, however, to get the "real" inches, which would add some time and cost to the setup. A file like this would take a matter of seconds on the laser. For us, this is almost perfect. The sizes have already been converted, and we don't have to guess at any placements, etc. Laser time would be the same as Sample 1. Another choice to make is whether or not to cut out each piece completely, or to leave the pieces in a "carrier" to place in the kit. 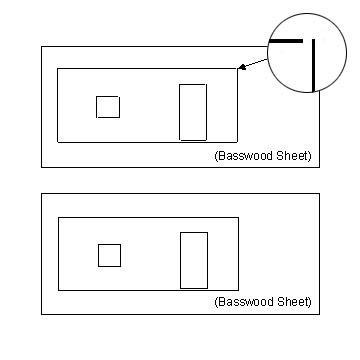 The top drawing shows the carrier approach: Note the gap (an arrow points to one example) left in place to keep the piece attached to the basswood sheet. All cuts—doors, windows, etc., as well as the piece itself stays attached to the sheet and are ultimately removed by the modeler. In contrast, the lower drawing will completely cut out all pieces. Because the pieces in the lower drawing have to be removed and packaged on the spot to prevent any mix-up, there is more operator time involved and therefore the cost here is a bit more. © 2006 Kappler Mill & Lumber Co.